In this template we first time used secondary expandable navigation that was created by codyhouse. They done it great and its works fine. First time we used this expandable menu in our blogger template and navigation menu credit goes to by codyhouse. Smooth and flexible menu bar in this template we used. Hope guys, you'll like this template. Download this supper blogger template for free. Paid version is also available. DreamLine is another responsive blogger theme of MS Design that compatible with all mobile device. Just see our previously released all templates. 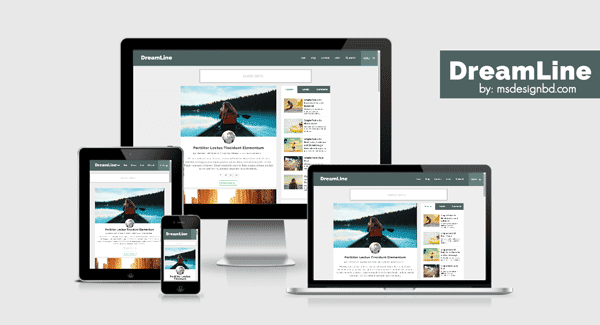 DreamLine blogging blogger template is also responsive which indicated that your website looks great on smartphones and tablet as good as they look on desktop devices. This template is compatible with all device. Responsive and mobile friendly blogger themes are most important in search results. So, use a proper responsive blogger template in your blog. 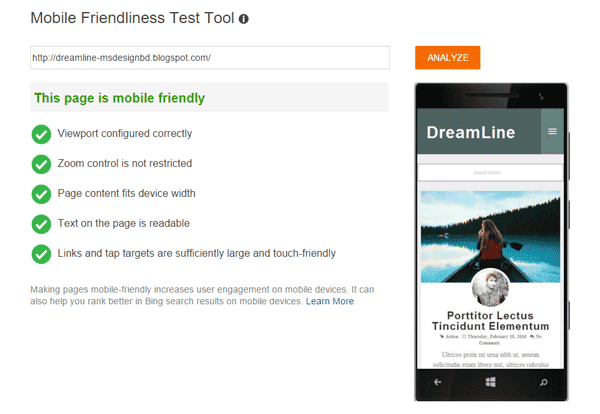 A mobile friendly blogger themes play an important role. Cause maximum of visitors are come from mobile specially on android apps and games download site. So, its too much important to make your blog mobile friendly. Google also like a mobile friendly blog. We always focus on Search engine optimization when design blogger templates. DreamLine professional blogger template is optimized for for search engine up to 100% SEO score. It is becoming our standard. Our all templates are search engine optimized for better performance in search result. After all, DreamLine blogger template is highly optimized to work great and help you to rank better in search engine. Use this template and see this awesome performance of this template. See a screenshot below. Continuously we used unlimited color option on our all blogger template from Palki Ultimate. You can change whole template color with one click. MS Design always design user friendly blogger template. Our template everyone can customize easily. By using this template you can change template color with your favorite color by one click. Free download DreamLine blogger template and enjoy this awesomeness. At first we used unlimited color option on Palki Ultimate blogger template and we continuously using this feature on our all templates. Hope guys you will like this template. If you have any questions about pro version of DreamLine, then feel free to Contact with us. or you can direct knock me on Facebook. Once again great work !! Thanks brother, stay with us. Muito Show cara! Parabéns! Se eu pudesse compraria seu template PRO, mas o dolar aqui ta em alta!! Muito bom! nyc one, but opera te half hoye ase kno?? [pre]<div class='loader'></div>[/pre] find this code and remove this out. any idea to how to change the width image entry post in main page? sir my blog is http://subodhfating.blogspot.com. In post comment section which is below the post when any body comments it shows only comment publish but the comment does not visible there. It only shows eg. 2 comments below that it actually doesnt shows what were that comments.